Living in one of Ontario’s automotive hubs means you know (all too well) the value of a car. And now there’s an easy way to buy your own vehicle: with financing through our car loan service. We help drivers with bad credit or no credit get the loans they need to purchase a car. Just apply for your loan online and get approved in 48 hours or less. Applying for an auto loan takes just minutes. Qualify for a car loan even with bad credit or no credit. Access to Windsor’s most competitive interest rates. How much information do you need to start my car loan application? Not much. Just your contact information and then a few details about where you live and work. Don’t worry — we won’t ask for your social insurance number or any references. How do I qualify for a car loan in Windsor? Does my credit score affect my car loan interest rate? Yes. We don’t do a credit check during the application process, but the dealer we match you with probably will. Fortunately, the dealers in our network specialize in bad credit or no credit car loans, so you won’t need perfect credit to get a fair interest rate. Does LowestRates.ca work with any Detroit dealerships? No. While Motor City is just across the river from Windsor, we only work with Canadian dealers. When you apply for a loan on our site, we connect you with a dealership in Windsor (or whatever Canadian city you live in) and they will offer you financing (in Canadian dollars). Once I have my loan, can I shop around at multiple dealerships in Windsor? No. You can only buy a car from the dealership in our network offering you financing. What’s a car loan term and which term should I choose? Your car loan term is simply the length of your loan, usually expressed in months rather than years (for example, a 5-year loan would be 60 months). Different car loan terms result in different monthly payments, so choose your term based on how much you can afford to pay every month. The longer your term, the smaller your payments. If you’re comfortable with higher payments, choose a short loan term (24 or 36 months). Your loan will be divided into bigger monthly chunks (your payments), but you’ll also pay it off faster and pay less money toward interest. On the other hand, if you need to keep your payments low, a long car loan term (48 months or more) offers smaller monthly payments. Of course, there is a catch: you’ll end up paying more interest over the total life of the loan. 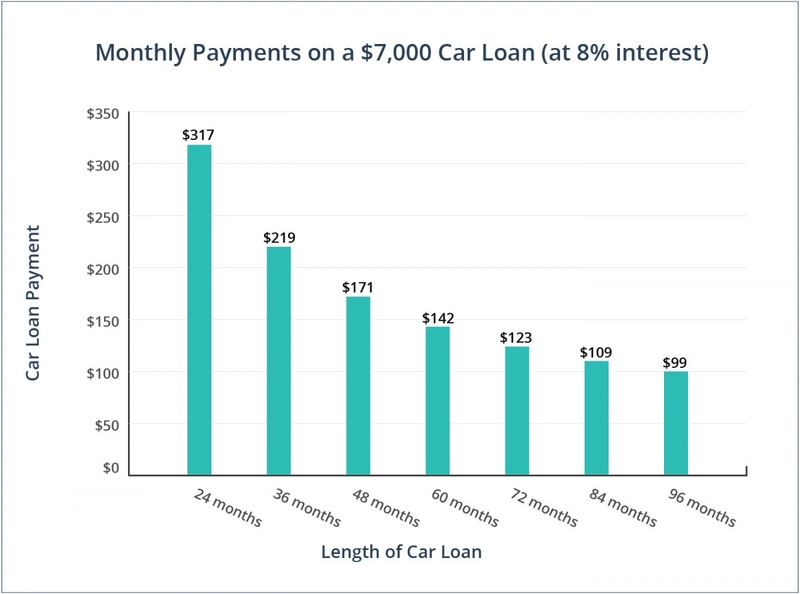 Check out the graph below to see how your monthly payments change depending on the length of your loan. How long do you plan on keeping your car, and how many years do you expect it to last? Don’t choose a car loan term that’s longer than you think the car will be on the road. You don’t want to pay for a vehicle that you’re no longer driving. We work with reputable dealers, but you should always get a second opinion. Ask a trusted, independent mechanic for an inspection and closely examine the vehicle yourself — look for signs of wear and tear or previous damage. Short loans save you money. Your monthly payments will be larger, but you’ll get out of debt quicker and minimize your interest charges. When you buy from a registered dealership, you get access to a broad range of legal rights and protections, courtesy of the Motor Vehicle Dealers Act and the Consumer Protection Act. I should only take a car loan from a bank. False. You may know the big banks a little better, but you also know that they can be difficult to work with if your credit’s bad. Getting a car loan through us is much easier and just as secure — we only share your info with the dealer offering you the loan. And, unlike the big banks, we specialize in car loans for drivers with less than stellar credit. That means we not only understand your financial situation, but we also know how to accommodate it. I won’t qualify for a car loan if I don’t have any credit history. False. Our car loan service is designed specifically for drivers like you — new grads, new Canadian residents, and anyone else who hasn’t built up their credit history yet. As long as you meet our other car loan application requirements, your lack of credit history won’t be a problem, and we can match you with a Windsor dealer. The Ontario Motor Vehicle Industry Council (OMVIC) regulates all vehicle sales in Windsor. False. The OMVIC only regulates vehicle sales between consumers and registered dealerships in Ontario. The OMVIC doesn’t oversee any private sales (i.e. between friends, family, or online sellers). As a result, you simply don’t have access to the OMVIC’s protections if you purchase a car that way. Keep this in mind before you set your heart on a vehicle from autoTRADER or Kijiji. I can’t get a credit card refund for a vehicle purchased in Windsor. False. If you have grounds under the Consumer Protection Act (example: the dealer failed to disclose key vehicle information), you may be eligible for a refund. If you are eligible, the OMVIC says you have the right to request a refund from the dealer itself or from your credit card company. The shorter your car loan, the quicker your positive equity (when your car is worth more than your loan balance) builds. Example: drivers generally start building positive equity in the 4th year of a 5-year car loan, but usually have negative equity in the 4th year of a 6-year loan. Windsor, say hello to your new e-vehicle charging station. The city’s Park St. East Tim Horton’s location will be home to a new electric vehicle charging station by March 2017. A survey of Canada’s big banks found that at least 70% of their new vehicle car loans were for terms of 6 years or more. Approximately 85% of Windsor’s commuters drive to their jobs. In other words, a lot of people in the city rely on their vehicles to get to work every day (and many of them need car loans).